Pittsburgh Underground: Movies That Have Everything: Sharknado At Hollywood Theater THIS FRIDAY!!! 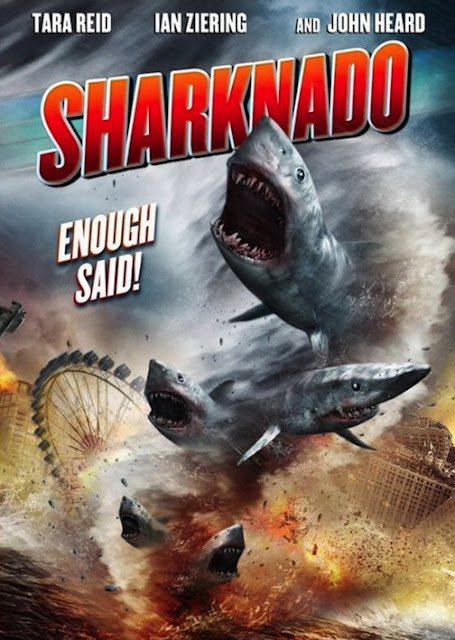 Movies That Have Everything: Sharknado At Hollywood Theater THIS FRIDAY!!! Look! Up in the sky! It's a bird! It's a plane! It's SHARKNADO!!! That's right kids - this Friday at the Hollywood Theater (1449 Potomac Ave., Dormont, PA), Sharknado, the made for SyFy TV movie will premiere with two showings - 7pm and 9pm ($7 for adults, $5 for kids and seniors)! Check out the trailer! The movie directed by Anthony C. Ferrante stars Ian Ziering, Tara Reid, & John Heard. The Plot: A freak hurricane hits Los Angeles, flooding the city with thousands of man-eating sharks who then terrorize the waterlogged populace. Nuff said. Believe it or not, this flick has gone viral and plans for Sharnkado 2 are underway. Heaven help us all!